Love the motif posted! I can’t imagine people being so rude about a quilt craft but then really…I work in an ER…yes, I CAN imagine it! I think your idea is a good one. I like to use different methods for different quilts. A quick intro to the choices might be an invitation for someone to try one. Applique can add a wonderful look and a fun task for quilters. It was great fun seeing you at PIQF! Love my Soft Fuse that I bought from you at Seven Sisters too! Even though I have done applique, when I see an expertly made quilt I can be a bit intimidated, so I can understand some of those comments. Your example made me smile, and I’m sure it would be appreciated. That made me laugh!!! Haven’t heard the crapplique comment before!!! The brochure on applique is a fabulous idea. I was nervous once about doing applique but decided to conquer the fear by jumping in and simply doing it, and I am so glad I did. I really enjoy the relaxation of applique and the portability of it!!! The brochure might work for some people, but I imagine that there are others who want the personal contact, and enjoy talking to a celebrity expert. I am not sure whose eyes the “scales will fall from” but it surely is worth a try. You are a tireless champion – keep up the fight! And I agree – some people may just be lingering to talk to a celebrity. Graphics for flyer looks awesome. 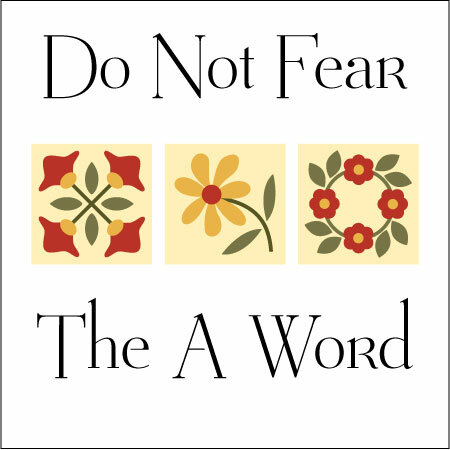 I’m not sure about having the word ‘fear’ as I lean towards more of Yes, I can encourgement. Such as Yes, you can applique!. Loved meeting you in your booth. Have you done applique demonstrations in your booth yet? If you can draw around a shape, then cut around that, use an iron and stitch a neat stitch then you can do applique, it’s really as easy as that. I think your brochure is a great idea. applique is all about hand stitching and patience for me. In my personal opinion (feel free to disregard it, too! ), I think the people that offer you negative comments wouldn’t benefit from your wisdom even if they had the wisdom & decency to hear it…so, don’t waste your breath on ’em. Stick to offering tips & encouragement to those that are intimidated & simply ignore the others. Again – just my opinion, offered in love. I think it is a great idea and love the photo and name you used, says it all. Agree with Debbie, love the motif, warm and encouraging. The brochure would be for all except the negative commenters! They would line their birdcage with it. I think you could do a dog and poop mini quilt just for them and the crapplique comment.